The creator of Sons of Anarchy ran to Twitter to get his game idea made. 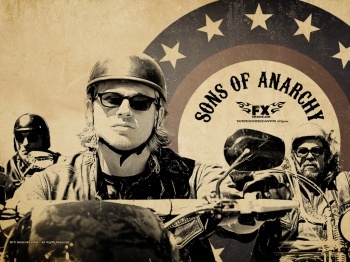 I haven't seen the FX show Sons of Anarchy, but I know it's about motorcycle enthusiasts in a California town and that Hellboy Ron Perlman is a cast member. Even with such passing knowledge of the content of the show - and the fact that it's the most highly rated show on the cable network FX - kind of makes it perfect for a licensed videogame. The creator and show runner of Sons of Anarchy Kurt Sutter thinks so too, and he took to Twitter this week to publicly plead with Rockstar, makers of Grand Theft Auto, to make such a game. "@RockstarGames you should make the SOA game," Sutter said. "I know it's an expensive/complicated process, but let's chat, see if we can make it happen." That message has been removed from Sutter's Twitter feed, even though it is still accessible by a direct link. Whether that's because he thought twice about making such a public request or because Rockstar contacted him, only Sutter can tell. It seems Sutter is committed to making a videogame starring his biker gang, but as late as this August negotiations with a major game publisher had reached their conclusion. "Getting no traction on the SOA game. Looks like our big publisher blew us off," Sutter wrote on August 11th. "Not a priority at FX. I doubt [the game] will happen." The thing is, Sutter has a good idea and he's chasing the right developer. Rockstar has made licensed games in the past, and made them well. The Warriors was one of my favorite games from the last generation, and it stayed very true to the cult movie of the same title. I'm sure Rockstar and parent company Take-Two Interactive aren't looking for new projects with the New York-based studio working on GTAV - they are probably in crunch mode to get it ready for a Spring release after so many delays - but I would certainly trust them to make a Sons of Anarchy game. Even if such a game never materializes, Sutter's got to be happy with how his show is doing. The fifth season is airing now and the premiere in September had 7.5 million viewers. Not bad for a cable show.